When I make this quince recipe I always feel like I am watching a Cinderella-style transformation. The lumpy, pale, hard fruit becomes a soft, delicious, rose-amber colored delicacy. 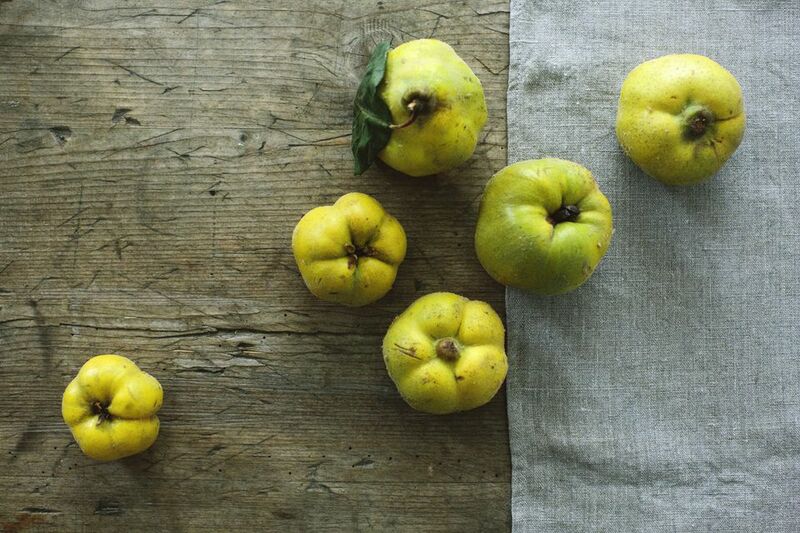 Serve these quinces and their syrup over fresh fruit, yogurt, or ice cream. They make a terrific food gift, especially because quince fruit comes into season right around the time of the fall and winter holidays. Have a large bowl of acidulated cold water ready (add about 1 tablespoon lemon juice to a half gallon of water). Peel and core the quinces. Slice the fruit into pieces not more than 1/4-inch thick. The shape of the slices is up to you: julienned, half crescents, small chunks. Any shape will work so long as no part of it is thicker than a quarter of an inch. As you work, drop the prepared slices of quince fruit into the bowl of acidulated water. About the color: Raw quince flesh is pale, like an apple or pear. If exposed to air it will oxidize to an unfortunate brown color. The soak in acidulated water minimizes that. The beautiful deep rosy color that is such an important part of quince recipes develops during cooking. Once all of the fruit is prepped, drain it in a colander and then transfer it to a large, non-reactive pot: no aluminum, copper, or non-enameled cast iron, which could cause discoloration of the final product. Stainless steel, heat-proof glass, or enameled pots are fine. Add the sugar, remaining tablespoon of lemon juice, and the water. Note that although I much prefer fresh lemon juice for most recipes, for canning recipes it is better to use bottled lemon juice. The reason is that commercially bottled lemon juice has a more consistent acidity level than freshly squeezed, and the acidity is important for safely preserving the fruit. Bring the ingredients to a boil over high heat, stirring frequently to dissolve the sugar. Reduce the heat to medium and simmer, stirring occasionally, until the quince pieces are soft and blush colored and the liquid has reduced by at least half. This will take about 1 hour. Use a slotted spoon to transfer the cooked quince to clean 1/2-pint or pint canning jars. It is not necessary to sterilize the jars for this recipe. Pack the fruit in, leaving 1 inch of head space. Ladle the cooking liquid over the fruit pieces in the jars. The fruit should be completely immersed in the syrup, but there should still be 1/2-inch of head space between the food and the rims of the jars. Gently press down on the fruit with the back of a spoon to remove any air bubbles. Wipe the rims of the jars clean and screw on the canning lids. Process in a boiling water bath for 15 minutes. Adjust the canning time if you live at a high altitude.